I've written many times of how I first fell in love with the game of football. 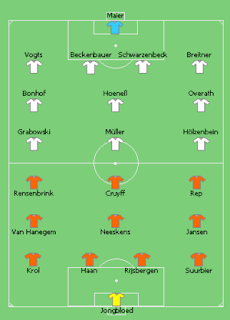 I accept that as a 7-year old my life was lived behind rose coloured spectacles, but that Johann Cruyff led 1974 Dutch team played the game as if it was a dream. Without any help I can recite that 1974 Dutch team (right) and I cried my little eyes out when The Kaiser lifted the trophy in Munich. In 1978 I was watching live football regularly and understood the intricacies of the game better. With no England to cheer, although brave Scotland were represented again, I reverted to my first love, the Netherlands. I was allowed to stay up late for the matches beamed into our tiny screens from Argentina. The games, stadiums and ticker-tape atmosphere were from another galaxy. Again the Dutch were undone by the hosts in extra-time at the Estadio Monumental Antonio Vespucio Liberti, a stadium I have since had the pleasure to watch a game in. The Total Football generation ended abruptly without a deserved title and the Dutch national team disappeared into the wilderness for ten years, returning to win Euro 1988 back under the tutorship of Rinus Michels. Captain Ruud Gullit, a player who could have easily fitted into the 70's Total Football side starred with Marco Van Basten, Frank Rijkaard the Koeman brothers Ronald and Erwin. Dennis Bergkamp came to prominence at USA 1994, a player that could find space in a jam jar and one of the best to have graced the Premier League. However for the second consecutive World Cup, the Dutch were eliminated by the eventual winners, this time Brazil. Four years later in France, Bergkamp was joined by Marc Overmars, Phillip Cocu, Edgar Davids, Frank de Boer, Ronald de Boer, Clarence Seedorf and Patrick Kluivert and it was the tournament of Bergkamp's unbelievable goal in the quarters against Argentina. Back in the semi-finals for the first time in 20 years, they suffered heartache going down to Brazil in the penalty shoot-out. The Dutch didn't qualify in 2002 and it signalled the end of that gifted group of players but incredibly for such a small nation, this next century has again produced another assemblage of top players sprinkled around Europe's best leagues. Wesley Sneijder, Arjen Robben, Robin van Persie plus elder statesmen Mark Van Bommell (once rumoured to be coming to Charlton, hard to believe eh?) and Giovanni van Bronckhorst have all shone in South Africa during an unbeaten run which started way before the finals began. Sure this 2010 vintage doesn't have the glitter of the Dutch teams of the 70's, 80's or 90's but then again it also doesn't have the bickering and ego's which slammed the self-destruct button so often either.